Eye-Fi is anything but your ordinary storage device. For those of you who have never heard about it before, Eye-Fi is actually a synergy between an SD card and a Wi-Fi module, which allows media to be transferred wirelessly straight to a computer without a single touch of a button. The latest Eye-Fi Mobile X2 model expands these wireless transferring abilities even further making them accessible from an iPhone, an iPad, or any Android-powered smartphone through a feature called Direct Mode. Here is how you do it: you pop the Mobile X2 into your digital camera and install the free Eye-Fi application on your smart device. After setting the software up to work with the Eye-Fi Mobile X2 and enabling Direct Mode, any photo or video that you take with your digital camera will be instantly copied to your smartphone or tablet in their full resolution. Eye-Fi cards work by creating their own Wi-Fi network, over which the transfers are being made at speeds considerably faster than what Bluetooth, for example, might be capable of. There is one little catch though. 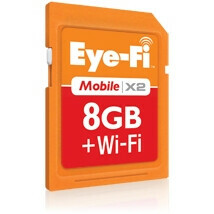 The software application that enables Eye-Fi cards to work with Android and iOS devices is still under development. Luckily, the manufacturer promises to deliver the software later this year with no price tag attached to it. Does it have to be from a camera to a computer/smartphone specifically... or can it be computer/smartphone to computer/smartphone? I only ask because of the, "...any photo or video that you take with your digital camera will be instantly copied to your smartphone or tablet in their full resolution." part. yea, this is a pretty awesome idea. Certainly better than trashy Bluetooth... as long as it works better. I agree, this is awesome...always love options. Although whenever I transfer files via Bluetooth, its always works really well and pretty fast too.